I am going to be honest from the get-go: I loved this race. Correction, I LOVED this event. As a result, this race review is going to be a two-parter because there is just so much to share. I hope you enjoy it. 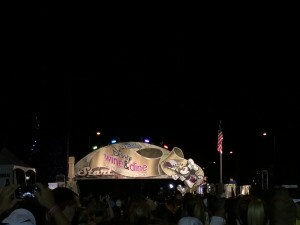 Chef Mickey welcomes all Casual Runners to the Wine and Dine weekend. I feel like I do not even need to answer this one. In my first year of running races, I caught the bug, big time. After running the 2013 runDisney Princess Half Marathon (Part One and Part Two) I was hooked on both half marathons and runDisney. 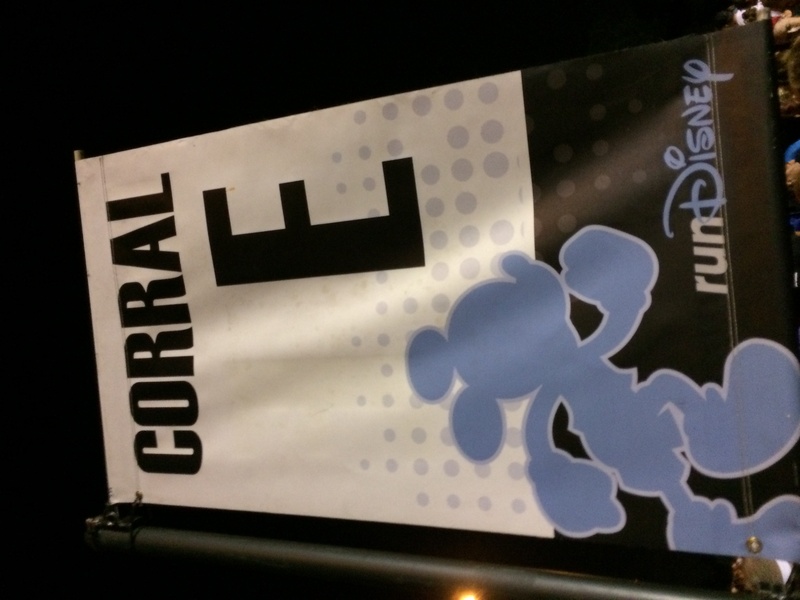 This event would be a chance to complete my 6th half marathon of the year with a group of great friends while enjoying Walt Disney world and the Epcot Food and Wine Festival. So yeah, I was going to run this race no matter what. If you do not know what the Epcot Food and Wine Festival is, I will tell you. It is pure awesomeness. The promenade that circles the World Showcase Lagoon in Epcot is about 1.2 miles (that is 2km for our Canadian, Australian, and European readers – don’t worry, we have your back). 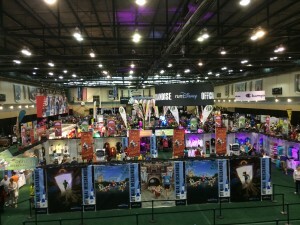 Once a year, Disney brings in dozens of temporary kiosks that serve specialty food and beverages (including of the adult variety) representing various countries and regions of the world. The festival is an awesome opportunity to sample tremendous food and drinks, while at Disney, and topped off with fireworks at the end of the night. What more can someone ask for? A half marathon? Sure! I’m in. This event was to be my first ever runcation, and I was excited to be sure. My good friends Jennifer and Jake were the ones who both re-introduced me to Disney World as an adult and the Epcot Food and Wine Festival. When we realized that we had a chance to do both while running a half marathon, we immediately began making trip plans. Add to that my good friend Andy, who had recently moved to Florida, wanted to run the race with us, and this was going to be a runcation to remember. 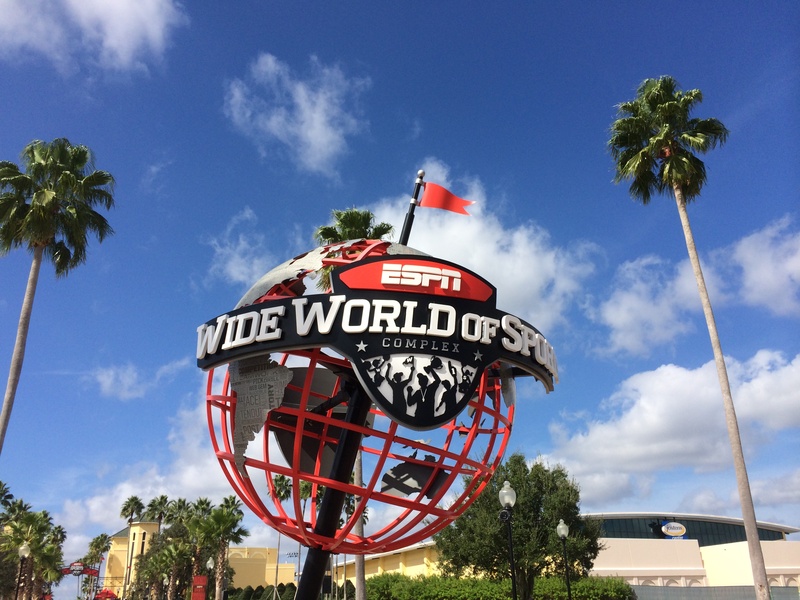 This was my first visit to the ESPN Wide World of Sports Complex – just look at that sky! Originally we had planned on flying to Orlando the Friday before the race and spending the week after the race enjoying the parks, but I had to go and ruin that. Because of my work schedule, we had to call an audible and spend the week before the race visiting the parks (instead of after). While I was initially concerned that we would over-do the parks and be tired for the race, we all took it in stride and everything worked out fine. Don’t get me wrong, we toured the parks for 8 days and had a wonderful time, but we also made sure to build ample rest and even a water park visit into our trip in order to keep our legs fresh for the race. The day of the race, Jennifer and Jake decided to sleep in, but I was too excited to be in Disney World and not go to rope drop at a park. Andy and I made our way to Downtown Disney where we each devoured not one, but two sandwiches from Early of Sandwich, all ostensibly in the name of carb loading. In truth, we couldn’t decide on what we wanted to eat, so we each picked our two favorites and then swapped halves so we could sample a variety. Gluttony never tasted so good. Afterwards, we made our way over to the World of Disney, where I proceeded to complete all of my Christmas shopping. Needless to say, my nephews were VERY happy with their Christmas presents that year. Andy and I then made our way over to the race expo. The main floor of the expo does look pretty sweet. 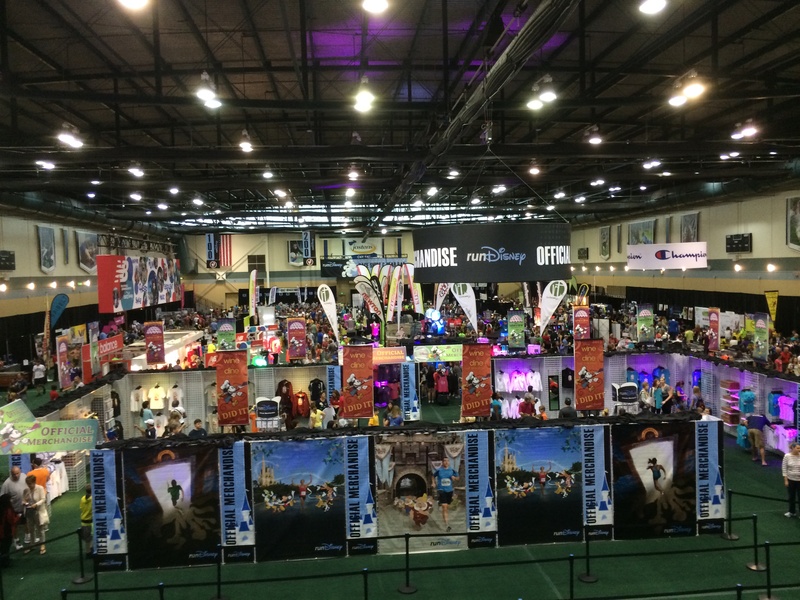 This was my second runDisney event, but my first time attending a race expo at the Wide World of Sports complex. Because Andy is a Florida local, we took his car instead of taking the event transportation. Driving to the expo could not have been easier and, in fact, they allowed private cars to park closer to the entrance than the event transportation, which means we got to save on walking. The weather could not have been more perfect. It was one of those picture-perfect Florida sunshiny days that makes you want to move to Orlando forever. The signage was easy to follow and the cast members quickly directed us where to go. Bib pickup was in the basketball arena. Since we went after the family 5k concluded, the crowds were very light and we collected our bibs quickly and were on our way next door to check out the rest of the expo. My main mission at the expo was to get my event shirt and my collectible art card from Lasting Commemoratives. I am not sure why, but, while the overall vibe of the expo is great, I do not find the layout to be particularly intuitive, and we had to do some doubling back to find the Lasting Commemoratives booth, and the one cast member who we asked for directions was unable to help us. We wanted to get naps in before the race that night, so we cut our time short at the expo, but had to make a pass through the official merch area. As it was Saturday afternoon, the merch lines were practically non-existent (the massive waves having cleared out earlier), and Andy was able to pick up a few souvenirs in no time. This being said, the line for the New Balance store was still insane, but everyone seemed eager and happy to get their special shoes. We snapped a few pictures and were soon on our way. Exiting was a breeze and the cast members directed us out of the parking lot with no fuss or muss. As a bonus, we got to take a quick tour of the starting corrals on our way out so we could get an idea of what to expect later on that evening. Less than 20 minutes after leaving the expo I was back in my bed at the All Star Movies resort getting a well-needed nap, but wondering whether I really needed to eat 2 full Earl of Sandwiches. Before I fell asleep, I concluded, yes, yes I did! Its a sign, no, literally, it is a sign. For this race we received a black, long-sleeved Champion tech shirt. It was a very nice quality and I like the design a lot. I am actually more partial to short sleeved shirts, especially for Disney races, as I like to wear them in the parks, but this is a nice shirt. As a part of our race entry we also received entry into the post-race party at Epcot (more on that later) and a $10 Disney gift card. I would prefer that they just lower the entry price by $10, but we all know that that is not likely to happen. Once again Lasting Commemoratives gave out their frame-able collectible art card that is specific to the event weekend. I love this as it is – pardon the pun – a great lasting commemorative of these events. For the 2014 Wine & Dine weekend they are changing this to a book mark, which I really wish they would reconsider and go back to the art card. It is great collecting all of the cards from all of your runDisney events. This was my first nighttime race and I really had no idea what to expect. Since I was flying to Orlando a week before the race, I packed for every weather eventuality. The race day forecast said that it was going to be NICE. As in, perfect race day conditions for me. So I decided on a tech tank top, a pair of compression shorts and running shorts. My New Balance Minimus running shoes, and my Under Armor wristbands and headband. I would be using my YurBurds Ironman Series Headphones with my brand new Iphone 5s. At this point in the year I had given up on wearing my IPhone in an armband and was opting for the high-tech option of putting it in a Ziplock bag in my pocket. The nap was amazing. But when we woke up around 7pm, I started to feel sick. I have no idea why, I was cramping pretty bad, which is very unusual for me. I got ready and went about my normal pre-race routine, which consisted of eating breakfast foods, even though it was the evening. I had bagels and iced coffee in my hotel room, and set about drinking my customary 32 ounce Gatorade. Thank goodness I had Jennifer and Jake there, because they prevented me from having any thoughts about not running the race even though I wasn’t feeling well. Andy planned on meeting us at the race. Given my experiences with the event transportation before the Princess Half Marathon, we decided to head to the front of the resort early to catch our bus. I can only speak for our experience at All Star Movies, but we walked right out as a bus pulled up and got on with no waiting. While every seat was filled, when the bus pulled away, there were no other runners waiting to board, so they seemed to be running ample busses. The only traffic we encountered was right as we entered the ESPN Wide World of Sports complex, but even that was not too bad. The starting line lit up for the night race. The walk from where the bus dropped us off to the bag check did not seem to be as far as the walk for Princess, and all bags were subject to search as we entered the pre-race area, which was a large athletic field seemingly completely surrounded by port-a-potties. Despite the fact that they seemed to have an abundance of these, there were still very long lines to use them. As is my usual custom, I waited in this line, but since I overhydrate before races, once I used the restroom, I got back into the line. Because the wait was so long, I knew that by the time I got to the front of the line I would have to go again. I still was not feeling well at all, so Jennifer, Jake, and I grabbed a spot on the turf in front of the stage and laid down. Well, I laid down, Jennifer and Jake were outfitted in killer Tron costumes complete with glow in the dark piping which made them quite the celebrities at this night race. They received a lot of well-deserved compliments. I just tried not to be sick. The music was good and lots of people seemed to be having fun, and I got to witness my first ever Disney World proposal right there on the stage. I believe that she said yes, but the crowd was cheering so loudly it was hard to tell. Andy arrived with about 20 minutes to spare and we decided to go to our corrals. Andy had the fastest proof of time, but decided to move back to be in my corral (Corral E), and we wished Jennifer and Jake well as they went off to their corral. There we stood in the back of the corral with about 10 minutes to go, and I felt as though I was going to be sick, really, really sick. I told Andy and then bolted back off to the field where the restrooms were. Fortunately, there were no lines. TMI Alert. I have no idea what was wrong with me, or how it resolved, but after one last stop in the restroom, I felt like a whole new man. All of the sickness passed and the adrenaline took over. I was pumped and ready to go, so I rejoined Andy in the back of Corral E. Lesson learned, if you aren’t feeling well before the start of the race, don’t be a hero, take a moment to compose yourself. Neither Andy nor I could believe my seemingly instantaneous recovery, but I was READY to go for my first night race. We saw the fireworks go off as they released each of the corrals in front of us. No doubt the excitement builds as you get closer to the starting line, but a lesson to all Casual Runners, your time does not start until you cross the starting line. You do not need to crowd to the front of your corral to get there faster. 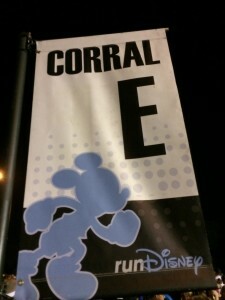 Andy and I had a blast hanging out in the back of our corral watching some people rudely push their way forward. We also saw people in the corral behind us trying to push their way forward as well, including those bumping up against the volunteers. The volunteers are an essential part of these races, they do not need to be treated like this. You will have your turn, just be patient. 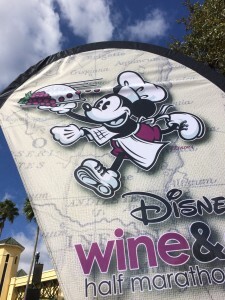 Speaking of being patient, that is going to do it for Part One of this race review, but be sure to check out Part Two as we take you all along the course and fill you in on the exciting post-race party at the Epcot Food and Wine Festival. Have you experienced the Wine and Dine Half Marathon or the Food and Wine Festival? Would you like to? Please leave us a comment below or contact us via email or Facebook using the links below. Please be sure to like us on Facebook and Twitter using the links below to receive updates on all of our great content, and subscribe to our YouTube channel as we are always adding new videos from a variety of events. See you out on the running trails.